During my recent wanderings of Spanish Harlem, I saw a sight that I knew was special. 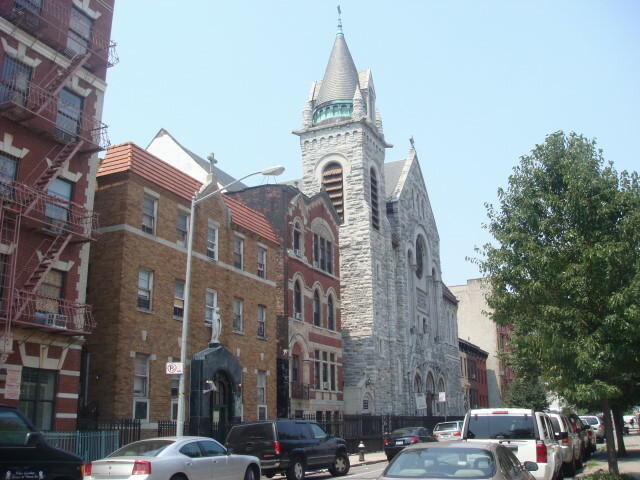 On 119th Street, just outside of the “Italian Harlem” area, was a nice looking church. I took just one picture. I figured it would just be another picture in my Spanish Harlem posting. Wrong. It’s the Holy Rosary Church and I found it interesting enough to give it a solo post. It turns out that it wasn’t part of the Italian Harlem area at all, but was founded by German and Irish worshippers in 1884 and the present building was done in 1900. I found a number of interesting things about the place. First, it is a wonderful and impressive structure. Second, according to the article I found on it, as late as 1975 it was doing Masses in English, Spanish, and Italian. (I just like that idea. Unfortunately, now it is just English and Spanish.) Third, the website of the Church is a dead link. C’mon guys, get with the program. [UPDATE 8/8/08: the website is active again.] And, fourth, the place was locked up as tight as can be on a Saturday afternoon. That’s sad. This entry was posted on July 19, 2008 at 4:41 pm and is filed under Harlem, Manhattan, Wanderings. You can subscribe via RSS 2.0 feed to this post's comments. You can comment below, or link to this permanent URL from your own site. We will link your site in our web site under “Press Room. Thank you. Famous, our Pairish Web site is not a dead link. I appreciate it, but the link still comes up empty. the web site is down for maintenance. should be back within the next 24 hours. Famous, the Web site is now perfectly working. Great! I’ve been looking for it and I’m glad you’ve got it going. I concur, God bless us all. When you come to Holy Rosary, look for me. I´d be happy to open the church for you. God bless.